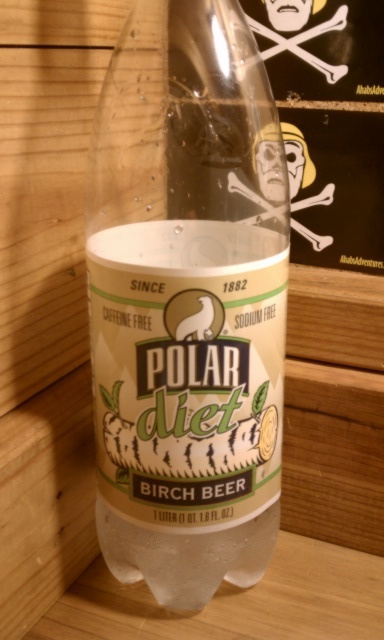 Today we got Polar diet birch beer in the one liter bottle. I have never had anything like this before except for a root beer. I do like Polar products but this time I was not impressed. Birch beer is usually made of several herbal extracts including the bark of the birch tree. To me it has what I familiarize as a wintergreen mint rush right at the end of its gulp and it is sure sweeter than most diet sodas. I probably would not return to this beverage but I will be reviewing a polar soda soon that I absolutely love! That’s for another time though. Lastly, if you notice the sticker in the background that’s of my friend’s blog located at http://www.AhabsAdventures.com a travel blog with a twist. Question of the Post – What’s your favorite beer?